Both the BMW X3 and BMW X5 are selling like hot cakes ever since the Bavarian carmaker revealed the newest generations of their SAV (Sports Activity Vehicles). For the BMW X3, a staggering increase of 60 percent in order volume has been seen when compared to the older model. Furthermore, the new X5 is a hot item as well and things are seemingly looking great for BMW’s SAV platform. However, it’s not all cheesy in BMW land. For many North American customers, the lack of options in the powertrain department is slowly pushing some customers away from BMW and towards, for example, the Jaguar I-Pace, Hyundai Kona Electric, or Tesla Model X. In turn, this prompted BMW to act accordingly. Confirmed by the carmaker just recently, both the BMW X3 and X5 will see a plug-in hybrid variant arrive rather soon. Revealed in a statement made by BMW’s CEO, Mr. Harald Kruger, the BMW X3 plug-in hybrid is confirmed for next year and the X5 is to follow suit in 2020. BMW is slowly filling up their range, especially when you consider that the fully-electric BMW iX3 is scheduled to arrive in a nick of time as well. According to currently scarce data, the BMW X3 xDrive30e will utilize the same powertrain used in the upcoming BMW 330e iPerformance. It will feature a 2.0-liter four-cylinder petrol engine and an electric motor, positioned between the engine and the gearbox. Together, they will deliver around 275 horsepower and approximately 37 miles (60 kilometers) completely emission free. For the BMW 330e, BMW claims that the vehicle will produce just 39 grams of CO2 emissions per kilometer. As for the fuel consumption in the 330e, BMW claims that the BMW 330e iPerformance is said to consume just 1.7l/100 km (138.3 mpg) – even though that’s probably never going to work in any real-life scenarios. But, if the 3 Series plug-in hybrid delivers 3l/100km, than we can see this selling rather well. Certainly, the BMW X3 is a heavier, more robust vehicle that will produce more CO2 emissions and consume more fuel, but it will still be pretty impressive if they can keep it around 3-4l/100km. For the BMW X5, on the other hand, according to current information, will utilize a 3.0-liter straight six-cylinder engine under the good. It will also feature a similar electric motor layout between the ICE (Internal Combustion Engine) and the gearbox. It is said that the BMW X5 xDrive45e will churn out a maximum of 394 PS (388 HP) and 600 Nm (442 lb-ft) of torque, making it never feel underpowered in any driving scenario. 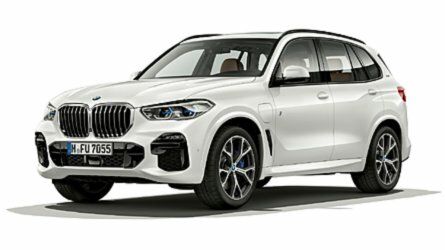 Those figures allow the X5 xDrive45e to sprint from 0-62mph (0-100km/h) from a standstill in just a 5.6 seconds, a full second faster than the car’s predecessor. The all-electric range for the X5 and X3 will be similar, around 30 miles in real-world scenarios. Clearly, a noticeable improvement over the outgoing xDrive40e X5 model. Hopefully, BMW plugs along a fully electric version of the BMW X5 soon. The possibilities are endless, especially thanks to the newly introduced seven-seater variant. However, the Bavarian carmaker is taking its own (slow) path towards electrification, and clearly, sales wise, it’s doing it right.